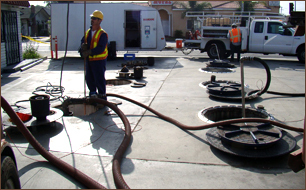 • Pump out and dispose of contaminated water (Hazardous and Non-Hazardous) to a licensed disposal facility on uniform manifests that we provide. • Poly tank pump out and crew to clean the tank for return to manufacture. • Dewater tank excavation holes. • Hazardous and Non-Hazardous drum pump out with drums remaining on site for reuse. • Car wash clarifier pump out & cleaning. To learn more about this particular aspect of our company services please click on the corresponding link below.